Our sports podiatrist Madeleine McMahon has compiled her top tips to ensure our next event is fun and fast! After we’ve been training for months and planning out every week leading up to the big day, we realise it is just around the corner- how did it come around so quickly?! We’ve endured 5am mornings, altered our social calendar and made sacrifices to get to where we are today. We don’t want all our hard work to go to waste by not being prepared. We have all been there and want to share our top tips to ensure we give ourselves the best opportunity to do our very best and achieve our goals on race day. a. 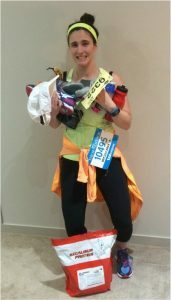 Lay out the clothes you will wear on the day, pin bibs to tops/ apply timing tags etc. b. Pack your bag that you will be taking. a. Ensure you eat well in the lead-up. b. Know what works for you. c. Organise your breakfast the night before. a. Get plenty of sleep in the week leading up to the event and especially the night before. b. Go to bed early as you may be waking up with nerves throughout the night. c. Make sure your alarm is set and give yourself plenty of time! a. In the lead-up, we can get nervous and start “Googling”. It is important not to change anything. Stick with how you have been training. b. Any minor change can disrupt how you perform, as your body is not accustomed to it. If you need any further help with race day tips please feel free to contact us. One of our sports podiatrists will return your email and answer any questions you have!